A fleet of spacecraft including the NASA/ESA Hubble Space Telescope has shown unprecedented details in the environs of a supermassive black hole. 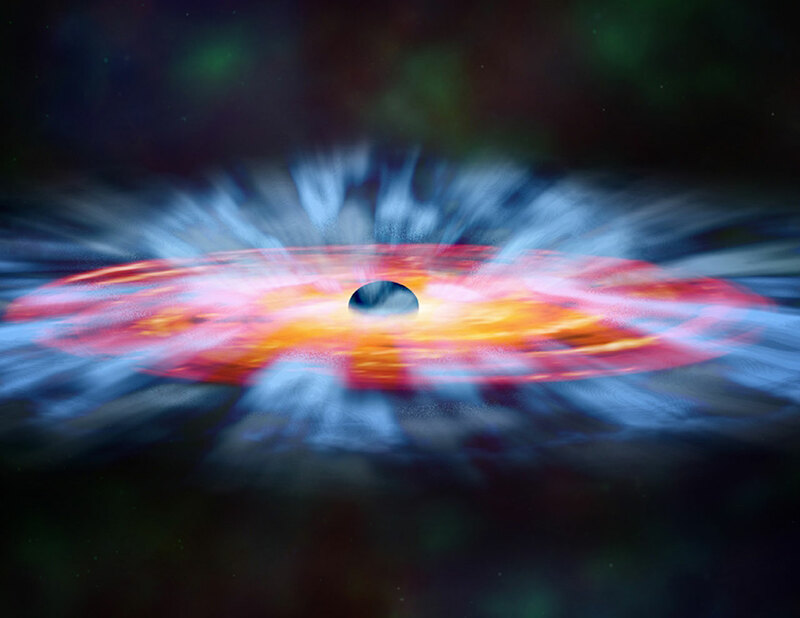 Observations reveal huge bullets of gas being driven away from the gravitational monster and a corona of very hot gas hovering above the disc of matter that is falling into the black hole. 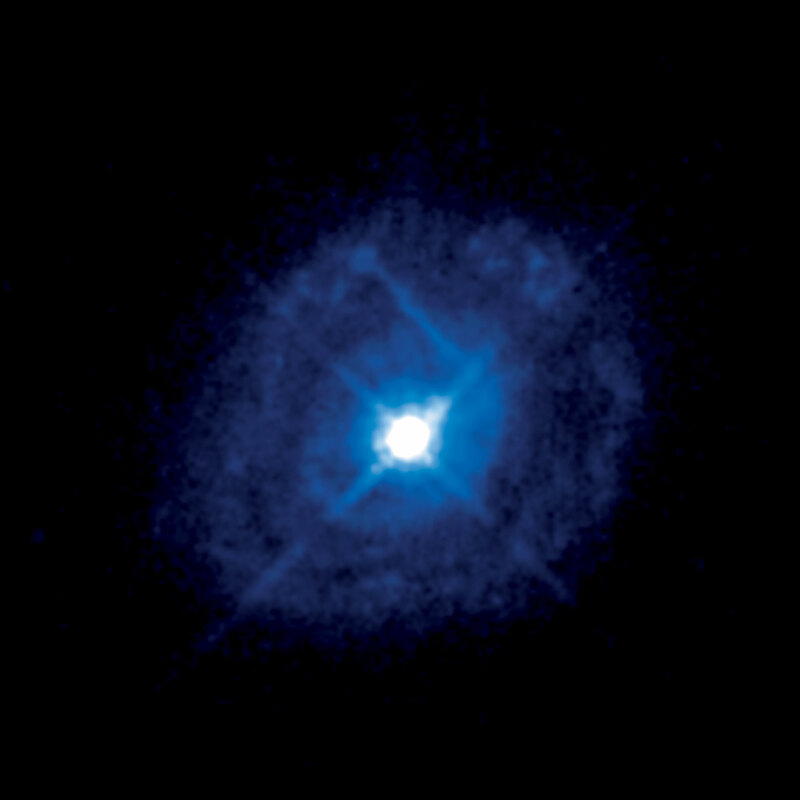 A team led by Jelle Kaastra of SRON Netherlands Institute for Space Research made use of data from ESA’s XMM-Newton and Integral spacecraft (which study X-rays and gamma rays, respectively), the NASA/ESA Hubble Space Telescope (for ultraviolet observations with the COS instrument), NASA’s Chandra (X-ray) and Swift (gamma and X-ray) satellites, and the ground-based telescopes WHT and PAIRITEL. The black hole that the team chose to study lies at the heart of the galaxy Markarian 509, 500 million light-years away. This black hole is colossal, containing 300 million times the mass of the Sun, and is growing more massive every day as it continues to feed on surrounding matter, which glows brightly as it forms a rotating disc around the hole. Markarian 509 was chosen because it is known to vary in brightness, which indicates that the flow of matter is turbulent. Using a large number of telescopes which are sensitive to different wavelengths of light gave the team unprecedented coverage running from the infrared, through the visible, ultraviolet, X-rays and into the gamma-ray band. The study is presented in a series of seven papers in the journal Astronomy and Astrophysics, with more expected to be published in coming months. A full account of the research can be read on the SRON website. This research was presented in a series of seven papers in the journal Astronomy and Astrophysics. The team is composed of 26 astronomers from 21 institutes on four continents.